When she died in 1964, Flannery O'Connor left behind a body of unpublished essays and lectures as well as a number of critical articles that had appeared in scattered publications during her lifetime. 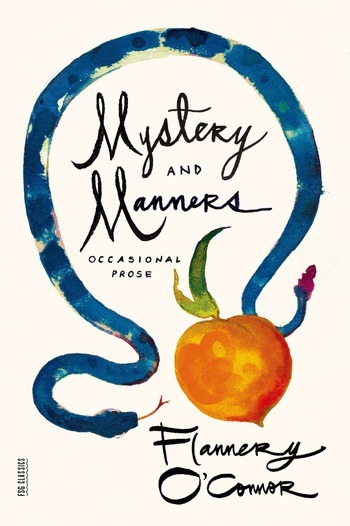 The brilliant pieces in Mystery and Manners, selected and edited by O'Connor's lifelong friends Sally and Robert Fitzgerald, are characterized by the boldness and simplicity of her style, a fine-tuned wit, understated perspicacity, and profound faith. The book opens with "The King of the Birds," her famous account of raising peacocks at her home in Milledgeville, Georgia. There are three essays on regional writing, including "The Fiction Writer and His Country" and "Some Aspects of the Grotesque in Southern Fiction"; two on teaching literature, including "Total Effect and the Eighth Grade"; and four on the writer and religion, including "The Catholic Novel in the Protestant South." Essays such as "The Nature and Aim of Fiction" and "Writing Short Stories" are gems. Their value to the contemporary reader—and writer—is inestimable. Flannery O'Connor (1925-1964) was one of America’s most gifted writers. She wrote two novels, Wise Blood and The Violent Bear It Away, and two story collections, A Good Man Is Hard to Find and Everything That Rises Must Converge. Her Complete Stories, published posthumously in 1972, won the National Book Award that year, and in a 2009 online poll it was voted as the best book to have won the award in the contest's 60-year history. Her essays were published in Mystery and Manners and her letters in The Habit of Being.